Stephanie Kelley-Romano interviews hundreds of 'experiencers' for an upcoming book. In the 1960s, more people claimed to be physically taken for hours at a time, she said. Over time, people claimed aliens were warping or freezing time. Pop culture reinforces people’s beliefs, she said. “People overwhelmingly believe in the possibility of extraterrestrial life, which I don’t think is a statistically improbable thing, but then to make the leap that they’re coming here and taking some of us over and over and over again? The way that they do that tells us about who we are,” she said. Her work began in 1996 by navigating what could have been a roadblock: How to ask people she calls “experiencers” to share their stories when you don’t believe they’ve actually been abducted? 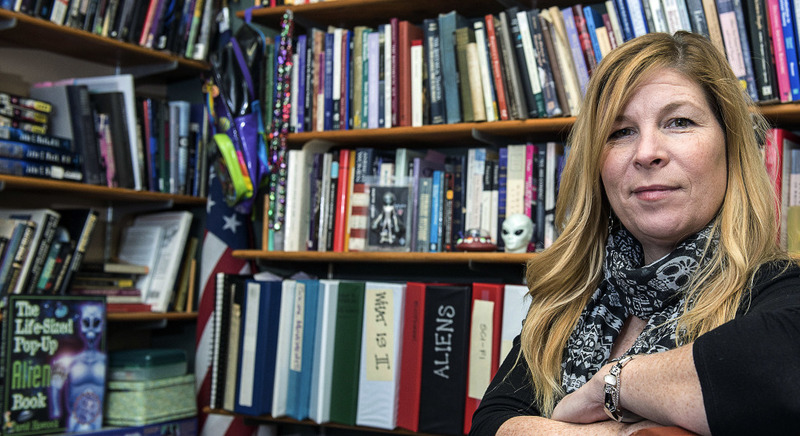 Kelley-Romano currently teaches a course called “The Rhetoric of Alien Abduction,” something that attracts outsized attention in the Bates College course catalog. She said some students make a point to talk to her before signing up to make sure she’s not “some sort of whack job,” she said. But, she added, some are interested for personal reasons. Two or three parents have come up to her after she delivered a professional talk to incoming students and prospective students to say, “We’re looking at Bates specifically because we saw your research and I am an experiencer,’ ” she said.